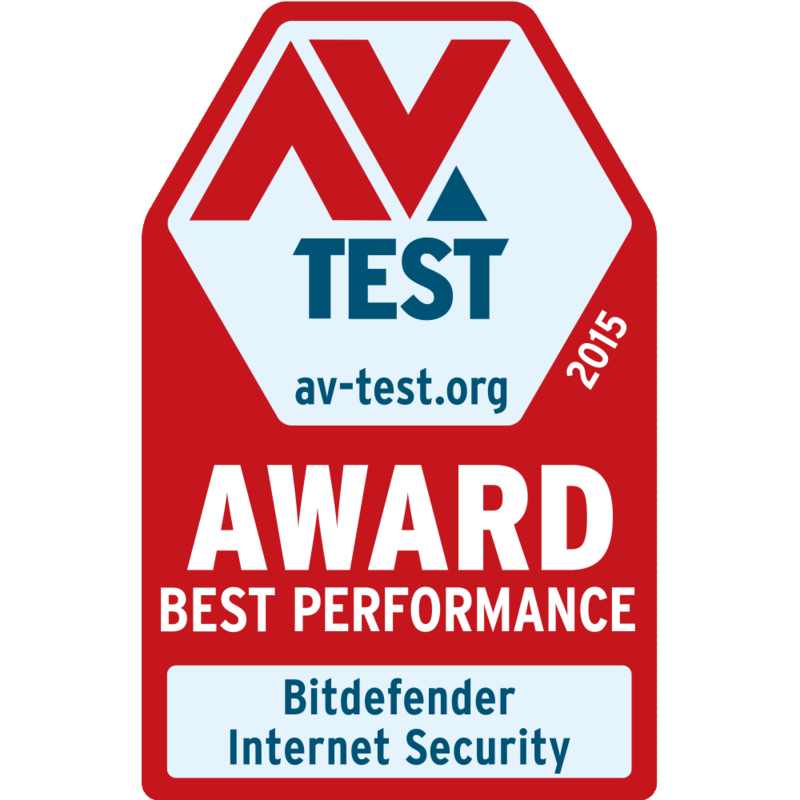 Bitdefender is regarded as one of the best antivirus and security companies in the world. Its products have won numerous awards and have been proved time and time again to be efficient and effective whilst offering cutting edge technology. 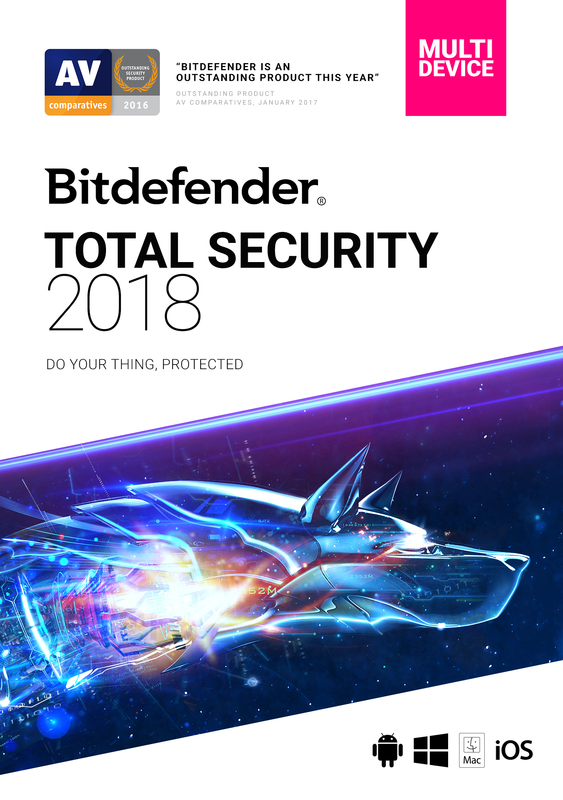 There’s a lot to offer from Bitdefender’s Total Security 2018. 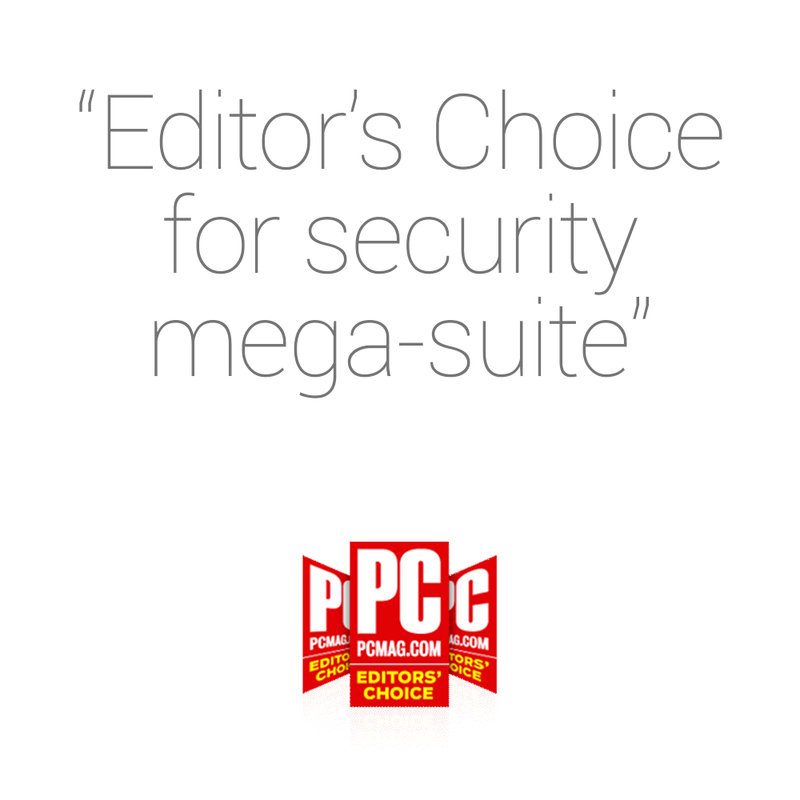 It’s one of the leading security suites available and is cited as possibly the best total protection packages in the world. Let’s see what it has to offer. Total Security 2018 s Bitdefender’s flagship product and offers comprehensive security packages for Windows, macOS and Android users all under a single web portal. Pricing does alter slightly. What do you get for your money? Well, Bitdefender has upped the ante with regards to its protection suite; not an easy task for a company with a long history of already providing the leading security suite on the market. Total Security 2018 is quick, easy to install and easy to understand, with the un boxing to installation and a complete system scan taking no more than half an hour. Most of the problems with modern security suites is the heavy interface that comes with the package. A modern suite must include a wealth of elements to make it even slightly competitive in an already saturated and quite aggressive marketplace. This in turn creates an interface that’s often too cluttered, and a little overwhelming for the newcomer, bitdefender though has managed to bring together a clean and sleek setup, with the most prominent features available with just a click or a couple of clicks of the mouse. Naturally you can dig much deeper into the settings, selecting predefined profiles and modes, or tweaking the core to either lighten the security, without compromising overall defences, or tightening everything up to an almost NSA-level of security clearance. It’s packed full of interesting and useful features, some of which you never thought you’d appreciate until you actually had them to hand. For example, the vulnerability scanner will hunt down any missing Windows updates, issues with Wi-Fi security and even weak passwords. Integration with your browser is excellent too, offering clearly defined green ticks next to search results that are classed as safe to visit, including integration with Facebook. You can also set up a secure vault for files that you want to mark as ultra-private and keep away from any prying eyes. You can command everything from the Bitdefender Central Activity Dashboard, which displays the current subscription along with the status of your Bitdefender installed devices, plus alerts, reports and so on. It’s a simple interface that keeps the stuff you want to see prominent, whilst gently hiding the deeper information that only the more advanced user may be interested in viewing. Of course, should anything untoward happen to any of the Bitdefender installed devices, then you receive the appropriate warning, interestingly, should you activate the parental features on any of the devices, the dashboard inform you of your child’s online activity, visited sites and social media behaviour. Ransomware is handled by an independent module that requires activation but once enabled automatically protects files in your Documents folder, with The option to include other folders too. Any attempt to edit one these protected files results in a message appearing, which you need to confirm the action This makes it increasingly difficult for ransomware to start encrypting and messing around with your valued data. On top of all the superb features though, is the excellent scanning engine. The Bitdefender scan is quick and doesn’t slow your computer down while being active in the background or while conducting a full system scan. 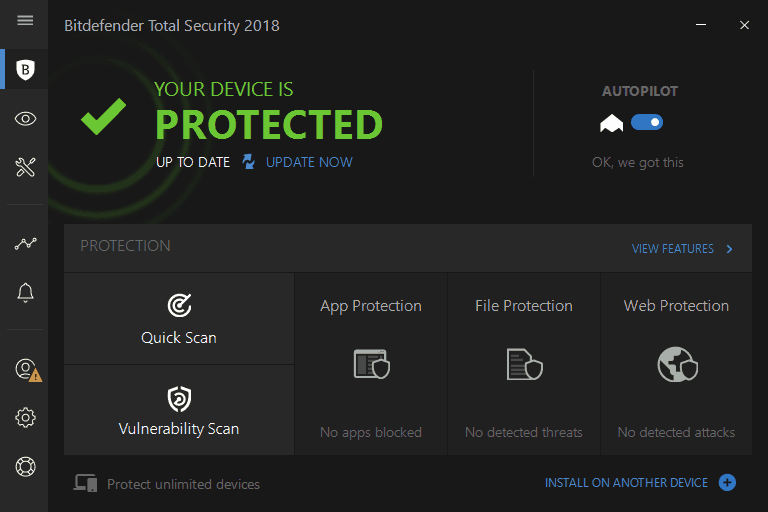 in short, if you’re in the market for a complete and fully featured security suite, then Bitdefender Total Security 2018 is the you should most definitely consider. Bitdefender Total Security 2018 is one of the best AV and protection products available today. Excellence across the board and at damn good price. 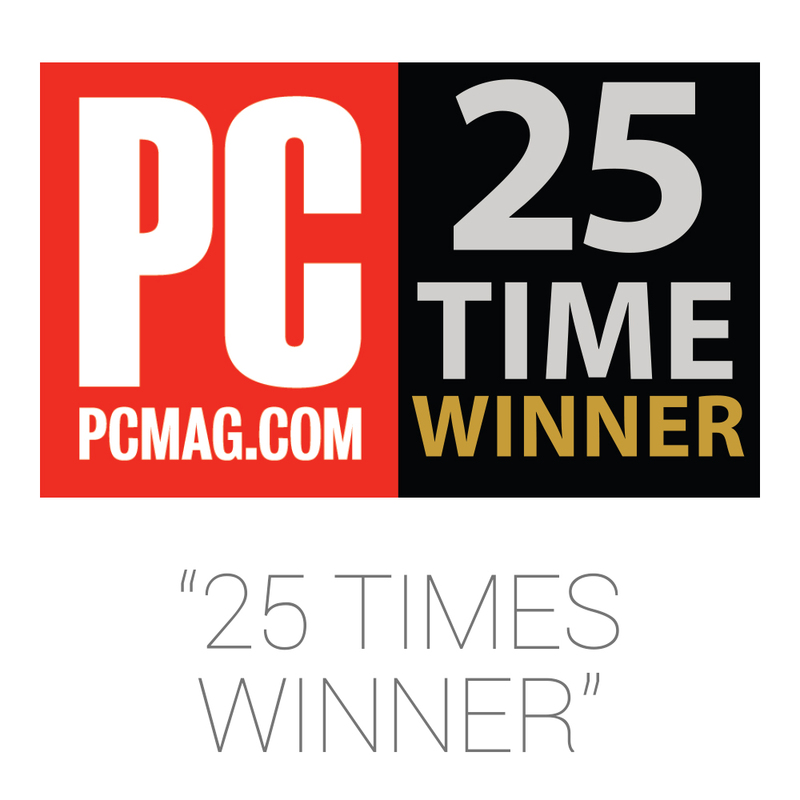 Although bitdefender is still our top suite pick, it was a very near-run thing. 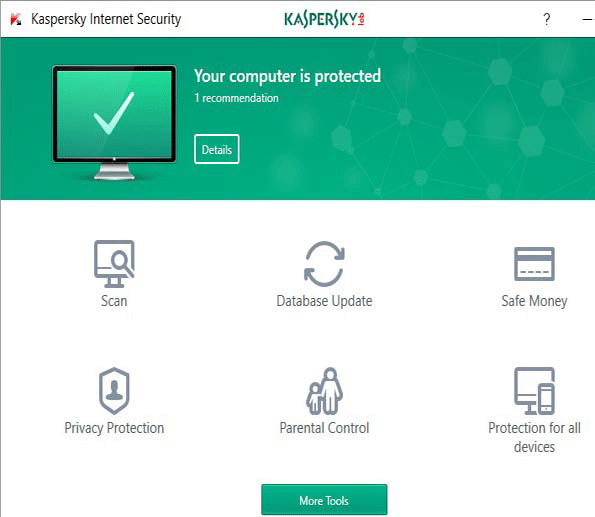 Kaspersky continues to improve, and Total Security has a feature set that very closely rivals that of BitDefender. All the tools you could really want are built into the suite – including backup, file encryption, webcam monitoring, cloud- based parental controls and a password manager. It even includes a volume-limited VPN for secure connections when you take your laptop onto public Wi-Fi hotspots. Really, the biggest thing stopping it from overtaking BitDefender is the price. In terms of features and capabilities, it’s on par. Still the best. A reader asked about security software that appears to charge extra to remove the problems it finds. Security Lead Analyst Neil J. Rubenking sets the record straight. Q: I found out today that my Amazon account was hacked and email address changed to an address with an .ru domain… I began to wonder if my Mac had a keystroke logger, since I don’t think I’ve fallen for any phishing emails. So after removing Kaspersky a few months ago, I thought I would check out security software again. I just read your review of Bitdefender for Mac on PCMag.com… When when you click “buy” on their site, you are offered an additional purchase of virus and spyware removal for one intervention. So it seems that the main program is geared toward finding but not removing the problem. I checked out Norton, and it also offers an extra-charge removal program. I also saw a blog online where someone was complaining that McAfee was going to charge them extra to remove what it found. Apparently this is common practice. It would be extremely helpful if your [reviews would go] over these extra charges. A: All of the major antivirus products both detect malware and remove it. Many of them offer a separate, extra-cost service whereby agents remote into your computer and fix problems, so you don’t have to. Most of those will apply this remote remediation at no cost in the rare event that the AV detects something it can’t remove. McAfee and Norton in particular have a “virus free promise”, saying that if the AV can’t fix a problem, their techs will do it at no cost; and if they can’t fix it, the companies will refund your money. It’s not uncommon for people to see these extra cost “concierge” services and think that means the antivirus won’t remove malware. Maybe bad marketing? Because that just isn’t the case.